(EDMONTON, AB)- Oilers Entertainment Group (OEG) announced the hiring of Edmonton-born and internationally-experienced venue management executive Susan Darrington as the new Vice President, General Manager of Rogers Place. Darrington joins Oilers Entertainment Group from AEG Worldwide where she served most recently as General Manager of Allianz Parque, South America’s first multi-use stadium in São Paulo, Brazil. There, she was responsible for all activities in the lead-up and opening of the facility in 2014, which saw more than 170,000 guests in the first 20 days of operation. After opening, Darrington oversaw all aspects of the venue including operations, programming, budgeting and staffing. During her tenure, Allianz Parque was nominated for New Stadium of the Year at the international Stadium Business Awards in Barcelona (June 2015). Prior to Allianz Parque, Darrington served as Vice President Facility Operations & Services from 2004-2012 for First & Goal Inc., operators of the 68,000-seat CenturyLink Field (nee Qwest Field). The active, multi-use venue is home to the National Football League’s Seattle Seahawks and Major League Soccer’s Seattle Sounders in Seattle, Washington. In addition to successfully launching CenturyLink Field, she oversaw all aspects of operations that included stadium expansion, facility use guidelines, venue operations for Seahawks and Sounders games, and worked with the entertainment industry’s top promoters to book U2 (360 Tour), the Rolling Stones, Kenny Chesney, the Dalia Lama and U.S. President Barack Obama. As Vice President, General Manager for Rogers Place, Susan will be responsible for bringing the venue to life, overseeing the overall management and day-to‐day operations during the pre‐ and post‐opening periods. She will develop and implement the overall business and operating culture for the building, ensuring the highest levels of service for the fans, employees and partners. She will also develop all operating infrastructure across multiple disciplines including operations, programming and marketing. 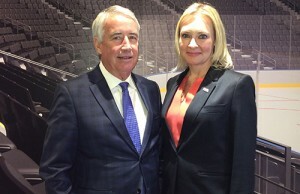 As GM, she will provide leadership with a strong public presence in representing Rogers Place and OEG. It is also noteworthy that Darrington began her career in Edmonton at Northlands Coliseum as an Usher at the age of 15.